Kids birthdays. You want it to be ALL the things. So much fun and yet, can be so much stress. And for what? That's the question you have to ask yourself in the planning process. Who am I doing this for? Entering this motherhood gig five years ago, the Pinterest pressure was at an all-time high. So many parties with extravagant decor, entertainment, favors and food - all in perfect unison. I remember feeling as though I HAD to create a board for my daughter's first birthday, pinning all the images I could possibly find related to an ocean-themed party. There were so many ideas! SO. MANY. IDEAS. It was exhausting! More exhausting than the options were the costs adding up. Professionally designed labels for food, activities, water (yep, for kids birthdays not just weddings), entry sign, birthday sign, high chair sign, fancy cake - smash cake plus dessert for guests, favors, need I go on? You know the drill. Then trying to justify those costs and what really matters to the guest of honor. I can't say I've completely lost the desire to have those event planner-esque parties. My career background includes a great deal of event planning as well as wedding assistance, but it's just different on someone else's dime. Thus, I've scaled back immensely, as I imagine many mothers do after the first few. If I can't reasonably do the extras myself I don't bother with it too much. This year for my first son's third birthday we went camping since he loves the outdoors, my youngest's second birthday San Diego Zoo, and for my daughter's fifth birthday we were in the south Georgia sticks visiting parents, which just so happened to be the perfect setting for a woodsy birthday. And because my daughter has a love for all things whimsical and girly, an enchanted fairy forest theme was perfect. Luckily my sister is an artist so she drew up butterflies, fairies and signs, and made forest game props with tin cans, pinecones and glitter. My husband took some old sheets and rope to make a fairy hideaway and I set up underneath. My mom bought butterfly catching nets and favor bags for the kids to "fish" out of the pond behind the house. The adventure started with us finding a note and gift out front from the birthday fairies. 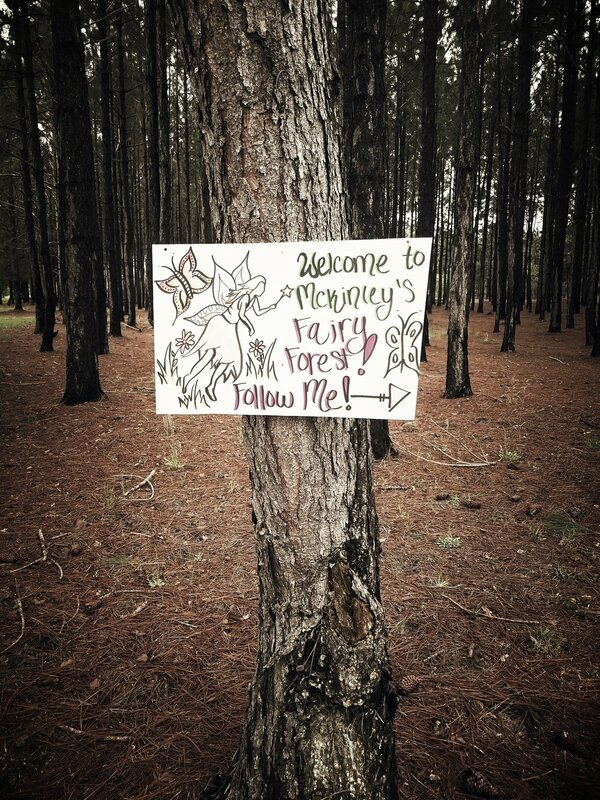 We then set out on a treasure hunt of sorts, searching for clues leading to the enchanted fairy party in the woods. The kids loved running from clue to clue and then arriving at the hideaway, where they found gifts and treats for the birthday girl and her guests. We played some simple games and then headed back to the house to sing Happy Birthday and enjoy the pink funfetti cake I made from scratch (adorned with these fairies I found on Amazon, and a sweet plate/napkin set I thought to be more whimsy than the cartoon options). You could go all out with this theme and make it even more magical, but this simple DIY and budget-friendly option was perfect for us. Check it out below! 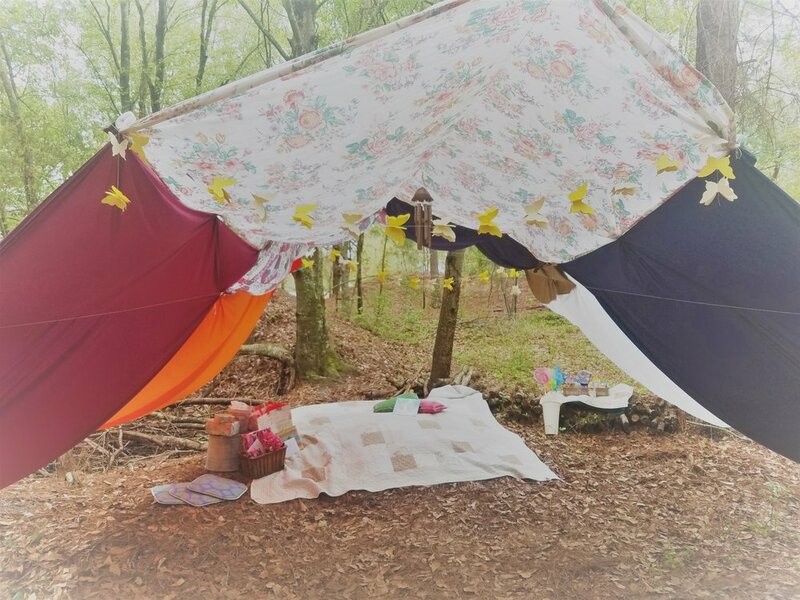 Posted in Parties and tagged with minimalist birthday idea, enchanted forest, kids birthday, enchanted forest birthday, fairy birthday, budget friendly birthday, girl birthday, fairy forest, fairy theme, diy birthday, fairies and butterflies, 5th birthday. May 11, 2018 by Janet Grant.